Suffragists Discuss Work for Final Month. 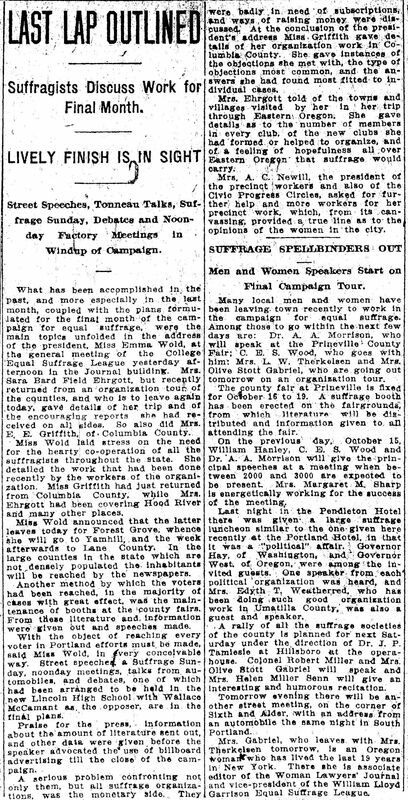 Street Speeches, Tonneau Talks, Suffrage Sunday, Debates and Noon-day Factory Meetings in Windup of Campaign. What has been accomplished in the past, and more especially in the last month, coupled with the plans formulated for the final month of the campaign for equal suffrage, were the main topics unfolded and in the address of the president, Miss Emma Wold, at the general meeting of the College Equal Suffrage League yesterday afternoon in the Journal building. Mrs. Sara Bard Field Ehrgott, but recently returned from an organization tour of the counties, and who is to leave again today, gave details of her trip and of the encouraging reports she had received on all sides. So also did Mrs. E. E. Griffith, of Columbia County. Miss Wold laid stress on the need for the hearty co-operation of all the suffragists throughout the state. She detailed the work that had been done recently by the workers of the organization. Miss Griffith had just returned from Columbia County, while Mrs. Ehrgott had been covering Hood River and many other places. Miss Wold announced that the latter leaves today for Forest Grove, whence she will go to Yamhill, and the week afterwards to Lane County. In the large counties in the state which are not densely populated the inhabitants will be reached by the newspapers. Another method by which the voters had been reached, in the majority of cases with great effect, was the maintenance of booths at the county fairs. From these literature and information were given out and speeches made. With the object of reaching every voter in Portland efforts must be made, said Mrs. Wold, in every conceivable way. Street speeches, a Suffrage Sunday, noonday meetings, talks from automobiles, and debates, one of which had been arranged to be held in the new Lincoln High School with Wallace McCamant as the the opposer, are in the final plans. Praise for the press, information about the amount of literature sent out, and other data were given before the speaker advocated the use of billboard advertising till the close of the campaign. A serious problem confronting not only them, but all suffrage organizations, was the monetary side. They were badly in need of subscriptions, and ways of raising money were discussed. At the conclusion of the president’s address Miss Griffith gave details of her organization work in Columbia County. She gave instances of objections she met with, the type of objections most common, and the answers she had found most fitted to individual cases. Mrs. Ehrgott told of the towns and villages visited by her in her trip through Eastern Oregon. She gave details as to the number of members in every club, of the new clubs she had formed or helped to organize, and of a feeling of hopefulness all over Eastern Oregon that suffrage would carry. Mrs. A. C. Newill, the president of the precinct workers and also of the Civic Progress Circles, asked for further help and more helpers for her precinct work, which, from its canvassing, provided a true line as to the opinions of the women in the city. Men and Women Speakers Start on Final Campaign Tour. Many local men and women have been leaving town recently to work in the campaign for equal suffrage. Among those to go within the next few days are: Dr. A. A. Morrison, who will speak at the Prineville County Fair: C. E. S. Wood, who goes with him: Mrs. L. W. Therkelsen and Mrs. Olive Stott Gabriel, who are going out tomorrow on an organization tour. The county fair at Prineville is fixed for October 16 to 19. A suffrage booth has been erected on the fairgrounds, from which literature will be distributed and information given to all attending the fair. On the previous day, October 15, William Hanley, C. E. S. Wood and Dr. A. A. Morrison will give the principal speeches at a meeting when between 2000 and 3000 are expected to be present. Mrs. Margaret M. Sharp is energetically working for the success of the meeting. Last night in the Pendleton Hotel there was given a large suffrage luncheon similar to the one given here recently at the Portland Hotel, in that it was a “political” affair. Governor Hay, of Washington, and Governor West, of Oregon, were among the invited guests. One speaker from each political organization was heard and Mrs. Edyth T. Weatherred, who has been doing such good organization work in Umatilla County, was also a guest and speaker. A rally of all the suffrage societies of the county is planned for next Saturday under the direction of Dr. J. P. Tamlesle at Hillsboro at the operahouse. Colonel Robert Miller and Mrs. Olive Stott Gabriel will speak and Mrs. Helen Miller Senn will give an interesting and humorous recitation. Tomorrow evening there will be another street meeting, on the corner of Sixth and Alder, with an address from an automobile the same night in South Portland. Mrs. Gabriel, who leaves with Mrs. Therkelsen tomorrow, is an Oregon woman who has lived the last 19 years in New York. There she is associate editor of the Woman Lawyers’ Journal and vice-president of the William Lloyd Garrison Equal Suffrage League.